When Jerome Powell and the president sat down for dinner at the White House in early February one wonders what was on the agenda. Treasury Secretary Steven Mnuchin, who also attended the dinner along with Fed vice-chair Richard Clarida, joked that having the Fed chairman over to dinner was “somewhat of a covert operation … so it didn’t create speculation.” The Fed press statement that followed went to great lengths to assure Wall Street and the rest of the world that nothing of consequence happened. Individuals at this level of government, though, do not have hastily-called, high-profile meetings at the White House simply to socialize and attend to their friendship. 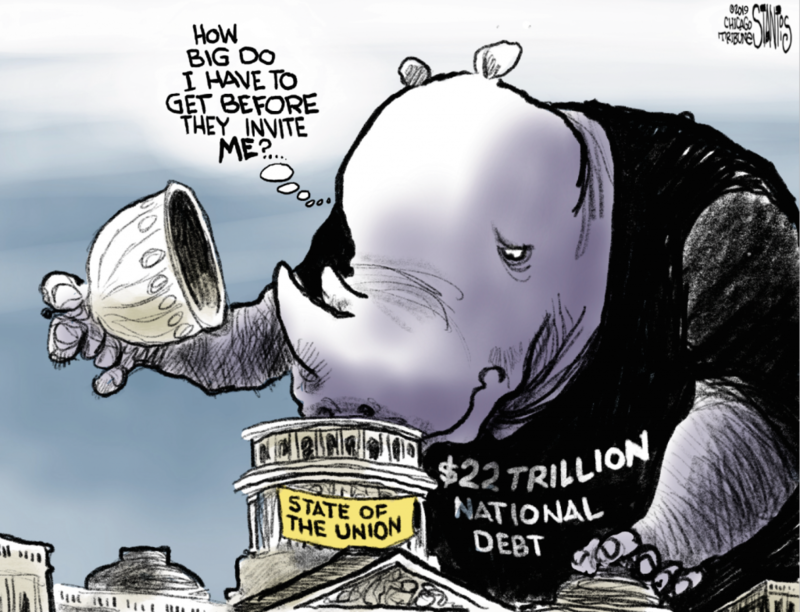 The rhinoceros in the room could very well have been how the federal government will go about financing the $12 trillion in debt Goldman’s Beth Hammack earlier brought to the Treasury Secretary’s attention and what role the Federal Reserve intends to play in the process. China and Japan, America’s two largest financiers by far, have withdrawn from the market and there is no certainty as to when they might return. That leaves domestic U.S. private investors and financial institutions to fill the yawning gap and, failing that, the Federal Reserve with a new round of quantitative easing. The chart below from the World Gold Council speaks to Russell’s point. 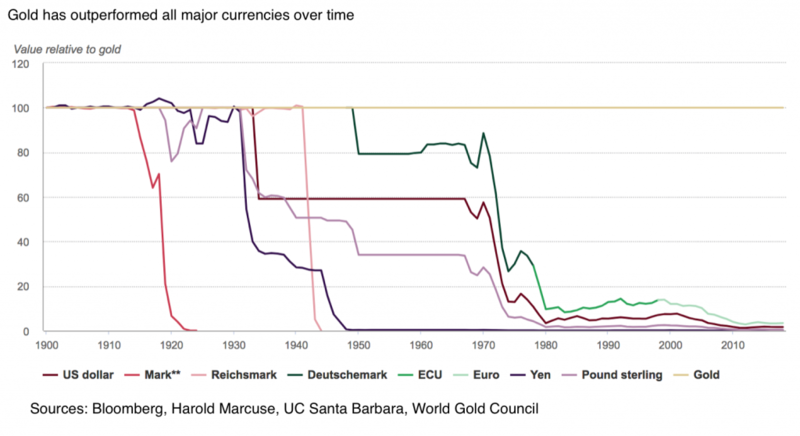 It shows the performance of various currencies – past and present – against gold over the long term. When the end comes, as the chart illustrates, it can come abruptly and without warning. For those who stick to the proposition that gold is not really an inflation hedge, or that it is not really a safe-haven against currency debasement, the chart offers instruction. For those who already own gold as a safe-haven, it provides justification. For those who do not own gold, it serves as an incentive. As the old saying goes: All is well until it isn’t. Michael J. Kosares has over 40 years’ experience in the gold business. He is the founder and executive director of USAGOLD (both the website and gold brokerage service), the author of three books on the gold market, and the editor of "News, Commentary & Analysis," the firm's client letter. He has written numerous magazine and internet essays and is well-known for his ongoing commentary on the gold market and its economic, political and financial underpinnings. Visit his website at www.usagold.com.